Representatives from 11 Caribbean countries and development agency partners will meet in Grenada’s capital of St George’s this week to discuss strategies to prepare for the impact of climate change. Grenada held the final consultation on its National Adaptation Plan (NAP) on Tuesday, 11 October, and will now host peers from the region to share lessons from its experience through a 2–day regional workshop. “Here in Grenada, we don’t have to look far for to see the impacts of climate change. We experience them every day,” said Senator Simon Stiell, Minister of State with responsibility for the environment. The NAP process was created by the United Nations as an opportunity for countries to plan for sustainable development in the face of climate stress. The Paris Agreement calls on all countries to engage in NAP processes, and each country’s NAP is driven by its unique adaptation needs. In this two-day NAP Assembly, adaptation planners from Caribbean countries will share their experiences of national adaptation planning and action. This NAP Assembly is co-hosted by Grenada’s Ministry of Education, Human Resource Development and the Environment; the UNDP Japan-Caribbean Climate Change Partnership (J-CCCP); and the NAP Global Network. Adaptation planners attending the event will represent 10 countries in the Caribbean: Grenada, Antigua and Barbuda, the Commonwealth of Dominica, St Kitts and Nevis, Belize, Guyana, Jamaica, St Lucia, St Vincent and the Grenadines, Suriname. The UNDP’s 2016 Caribbean Human Development Report warns climate change impacts such as droughts, floods, saltwater intrusion, and sea level rise could pose a threat to food security in the Caribbean region. The Caribbean NAP Assembly aims to outline next steps in the NAP process for countries in the Caribbean region, and how development partners such as USAID and the UNDP J-CCCP can coordinate their support to help countries to advance their National Adaptation Plans. “UNDP’s commitment to addressing climate change challenges within the region is certainly seen with the advent and subsequent activities of the J-CCCP. 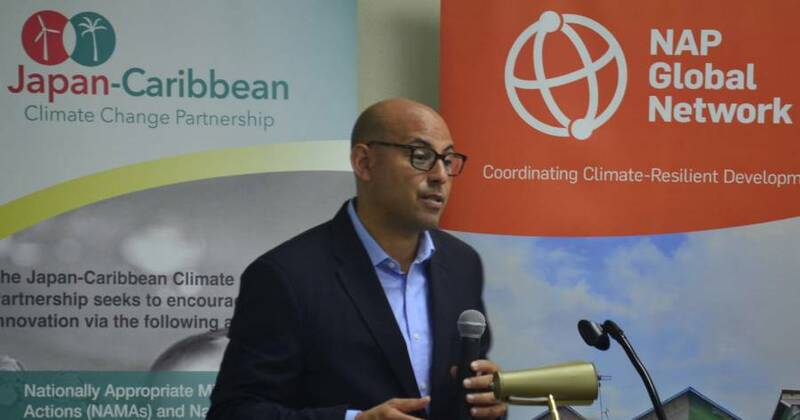 Japan is dedicated to promoting climate-resilient development approaches in the Caribbean, and has been making key investments in climate change adaptation technologies in the region,” said Chisa Mikami, UNDP’s Deputy Resident Representative.